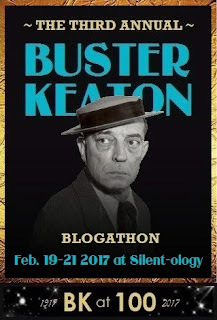 This is my entry in the Buster Keaton Blogathon hosted by Silent-ology. Buster Keaton, along with Charlie Chaplin and Harold Lloyd, are possibly the triumvirate of slaptick comedy from the silent era. Keaton's career spanned from early vaudeville days, when he performed on stage with his parents, right up until his death in 1966. (He died in 1966, not long after having completed work on what was to be his final appearance on screen in A Funny Thing Happened on the Way to the Forum). During the span of his film career, which began in 1917, he made some 100+ films, many of which, in those early years, were shorts (films which had a running time of 30 minutes or so). A number of those early features were with Roscoe "Fatty" Arbuckle. Buster graduated to full length films. His first headlining role in a feature length movie was one called 3 Ages, but he really came into his own with his third feature Sherlock, Jr, a movie in which Buster played a movie projectionist who enters, via a dream, into the fantasy world of the movie he is showing on screen. One case where he did do a portion of his part in silent mode was the classic episode of the TV show The Twilight Zone, tiled "Once Upon A Time". The episode is a fan favorite, myself included. 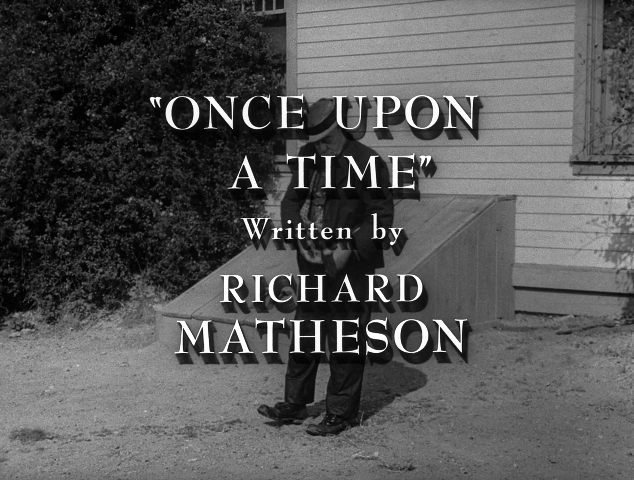 As indicated in the screenshot above, this episode was written by Richard Matheson, one of the better known contributing authors to The Twilight Zone. "Once Upon a Time" was directed by Norman Z. MacLeod, no stranger to comedy himself, having directed many comedies in Hollywood, including two Marx brothers movies, and several Bob Hope movies. Coincidentally, the "Once Upon a Time" episode aired just a few days after I was born. The story begins, fittingly, in silent movie mode, as the time period is 1890. 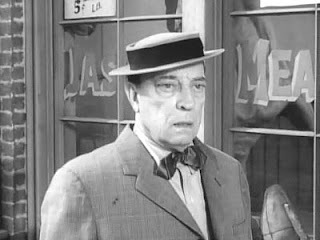 Woodrow Mulligan (Buster Keaton) is a man who wishes that life could be a lot more quiet and peaceful. He is frustrated with lfe where he thinks 17 cents a pound for sirloin steak is outrageous, bicycles are a road hazard, and the noise of livestock is just too noisy. Woodrow works as a janitor for a scientist (Milton Parsons), who has created a time helmet that will allow the wearer to go into the future. Woodrow decides to use it. 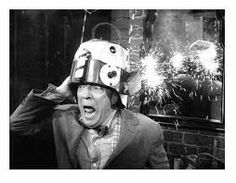 The slapstick scenes where the helmet starts shooting fireworks and panics Woodrow is just priceless. Woodrow ends up in 1960, where to his shock it's even noisier and costlier to live. To make matters worse, the time helmet breaks leaving him stranded. The transfer to the present (1961 being the "present" at the time of the broadcast) changes the show from silent to sound. For those of you who have never heard Keaton's voice, you will get to do so. The slapstick still continues as a kid absconds with the helmet and Woodrow has to chase him down. 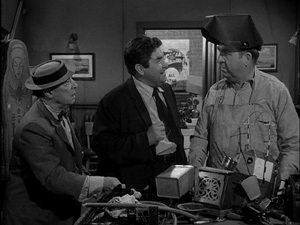 He runs into Rollo (Stanley Adams) who, being convinced Woodrow really is from 1890 and not some crackpot, endeavors to help him fix the time helmet. They enlist the help of a repairman (Jesse White). With a fixed helmet, Rollo tries to use the helmet to back to 1890, and Woodrow tags along for the ride. But 1890 turns out to not be the great thing that Rollo was expecting and he begins to miss the comforts and pleasures of 1960. So Woodrow slaps the helmet on Rollo and sends him back. 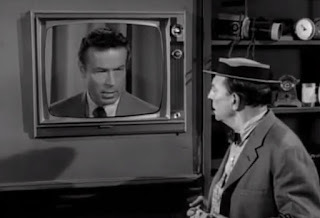 The Twilight Zone tended to be bleak most of the time, but this is one of a handful of episodes that used humor to get the point across to its viewers. Fans of Keaton's slapstick style will not be disappointed. Of all the humorous episodes during it's run, this one is by far the funniest. I'm going to stay here in the 2000's myself. If not for the internet, at least for the air conditioning. Hope you had fun with this one. The comic episodes on usually dramatic series always strike a chord with fans, don't they? In this case, the popularity of the episode is well warranted. The time travel aspect combined with Buster is a true winner. 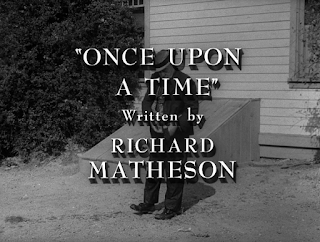 Oh, that Richard Matheson! Matheson had a good grip on the subject of fantasy. I read a book of his short stories once. And I used to have a copy of "I am Legend" (the basis for "The Omega Man" and the Will Smith movie of the same title) Thanks for reading. Thanks for the overview of this classic episode, I agree that the lighter episode was a nice break from Twilight Zone's usual fare--as brilliant as it was. It's always funny to see characters from decades ago complaining about the "hectic pace of modern life"--makes us think twice when we do the same thing, eh? Humor is my life. Always liked the funnier stuff. Thanks for reading. Hi Quiggy. I remember reading about this episode many years ago and thinking I would never get to see it. No one was rerunning The Twilight Zone because it was black and white. Finally a local San Francisco station started rerunning shows from the late 1950s and early 1960s and I got to see this episode. It was worth the wait. I keep saying we're lucky we live today. We can see wonderful shows like this. The Sci-Fi channel occasionally runs a marathon of them on holiday weekends. I still haven't acquired the entire series, but I see them there or online. Thanks for reading. Hi Quiggy! I wanted to let you know that you won a copy of the Industrial Strength Keaton DVD set in a drawing I held for the blogathon participants. (I originally drew a different name, but she already had a copy so I drew again and you're it!) This is set of Keaton rarities like commercials, TV appearances, and even one of his '30s features. You can contact me on my "About Silentology" page so we can email each other about the details: https://silentology.wordpress.com/about-silentology/ Congrats!! Thanks. I sent you a message. Brilliant and needs to be remembered more today. Lucille Ball always attributed her flair for physical comedy to her mentor Buster Keaton, who she used to watch working on the RKO lot when she was just a showgirl. Reading what she said about him made me seek out his work and find out who he was. I don't watch enough silent movie comedians. I've only seen The General and this episode of TZ for my Keaton fix. Should seek him out more. Thanks, Chris. As always, Buster does not disappoint! Thanks for a lovely review. Even in his older age he still hadn't lost his touch. Thanks for reading. All Twilight Zone episodes are good at their proper time. This one is good any time. thanks for reading.